We all hate corruption. Why? Because it creates an disparate, divided state, part of which is corrupt, and part not. As a future monarch of a futuristic society, I want my state to always be in unison. So in my administration, all bureaucrats will be corrupt. 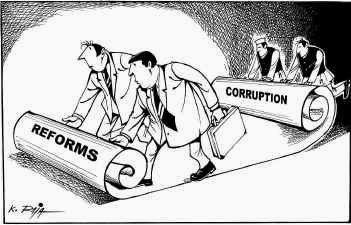 In fact, corruption will be the sole criterion for successful career growth; the more corrupt the official, the higher up the ladder will he be. To the righteous, this idea may seem outrageous, but hey, isn't this an unfair world already? A constable of the local police earns more than a software developer today. So by the classical laws of measurement, it will be fair to say that he produces more value to the state than the software guy. And it then becomes the state's responsibility to reward him for what is rightfully his. What is a society constituted of? Common people! The Aam Aadmi! And only if each of these "Aam Aadmis" progresses that the society will progress as a whole. And what better a way than legalizing what is already widespread?